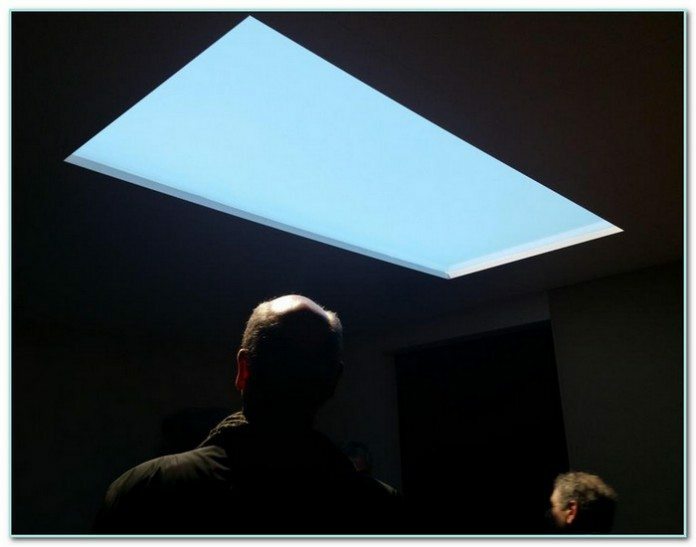 What looks and acts like a skylight, but isn’t a skylight? Is it raining for the fourth day in a row? Would you like to dial up some sunshine? Maybe it’s been sunny for so long you’d love to see some cloud for a change. Just turn down the sun and turn up the overcast. It’s now a commercial reality. Almost as good as an outdoor bathroom! Of course, you’re not really changing the weather, but you are changing the light that weather produces. Most people respond positively to sunshine. It elevates their mood. Conversely, long periods of rain tend to depress most people. Artificial lighting has always been able to brighten a room. But that part of the light spectrum used doesn’t fool our brain. It’s artificial… period! That has just changed! Scientists from the University of Insubria, Italy, have reinvented interior lighting by using white LED’s and a clear polymer screen. Without getting too technical, the design achieves an effect called Rayleigh scattering – the reason we see our sky as blue. This is done by coating the polymer panel with two sizes of titanium dioxide nanoparticles. This results in blue being the dominant wavelength. The mechanics of this panel are that the LEDs serve us the sun while the polymer screen acts as the atmosphere. Voila – sunshine anytime and anywhere you want it! Branded CoeLux, the lighting system comes in three kinds, each imitating sunlight at different angles. The first is the CoeLux 60 which emits bright, tropical light and the maximum luminance contrast of light and shadow. The CoeLux 45 is for those with a love of the Mediterranean climate. It offers a balance of light and shade. And then there’s the CoeLux 30 which is installed on walls so that it imitates the sun low on the horizon. Effectively, it mimics summer light in the high latitudes, casting soft light and long shadows. One of the many possible uses of these lights would be in hospitals and hospices, where attitude can be directly linked to wellness. Another use would be in offices, where many well documented studies show a strong correlation between natural light and productivity. In fact the studies show that ‘natural light’ workers are happier, have less absenteeism and fewer illnesses than comparable groups working under conventional artificial lighting. These ‘skylights’ can bring the sun into the centre of any office area, regardless of how far it may be from the perimeter walls. The panels were first exhibited in March this year, in Frankfurt, Germany. Commerial production has now begun and the system will soon be available globally. CoeLux is not just a fixture to help you see things more clearly. It doesn’t just light up the room. It lights up your mood! Soon homes will be cosier and work is going to feel less like work. Can you see this being installed in your home? Share your comments and ideas in the section below! Previous articleAre you, or do you know, a hoarder?